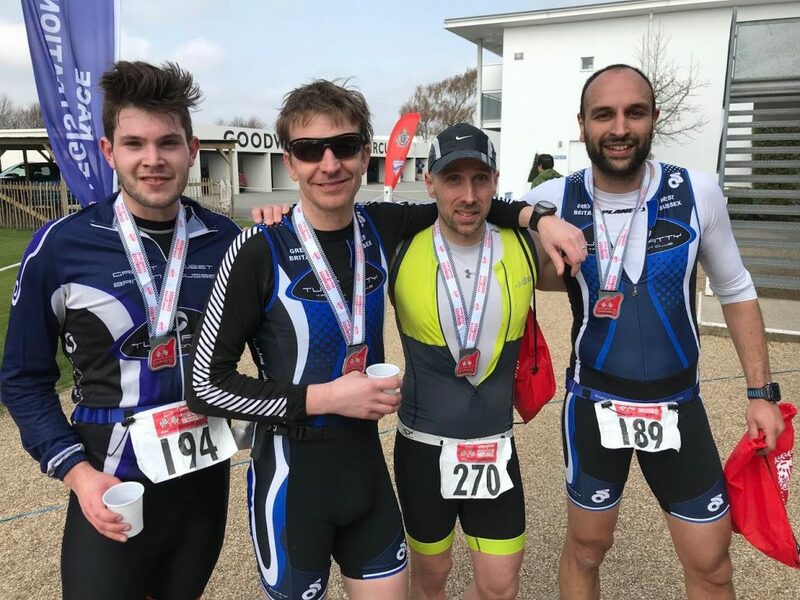 “Goodwood Duathlon (short course) was the first race of the season for myself and Andy Crawford, and Stu Harvey’s first ever multi sport race! 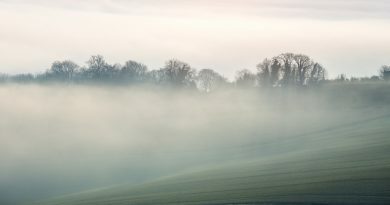 I prepared for the race by forgetting how to prepare for a race, which led to a hurried “warm up” run around the house looking for all my bits of hibernating kit, and some emergency bike repairs at the Goodwood Race Circuit an hour before the race was due to start! Conditions were relatively good on the day, but a stiff breeze made the top turns quite tricky. With the race being around the (circular) race track, it did mean we enjoyed some tail winds along the home straight though! Stu managed to catch a cold in the week preceding, so did very well to make it to the start line in the first place, but still got a very good result finishing 30th. Just the swim to add Stu!! 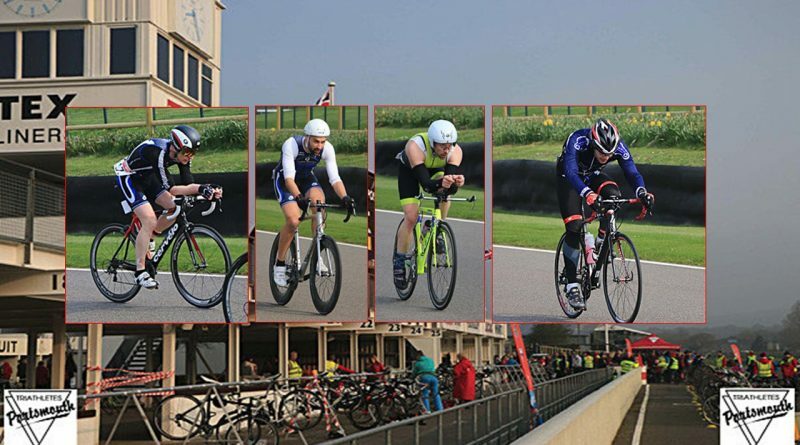 I (for the second time at this event) left my helmet on leaving T2, with the race referee heavily penalising me – by just laughing at me (thanks Clive Harvey!). I came home in 9th (3rd in Age Group). Andy Crawford ran an excellent race, and finished 5th (2nd in Age Group). Had the award for a overall podium place been Cliff Bars or a 6 pack of sports bottles, he reckoned he could have pushed himself to a podium. It was great to see Steve Woodbridge also doing well crossing in 14th position. Overall an excellent race for the Tuffs, and I thought it was generally a really well run event. I’d highly encourage more to do it, but you need to sign up early! “Goodwood was just about getting through for me. Recovering from a back strain over the last few weeks I needed to ensure I didn’t push it too hard. With that in mind somehow I ended up running with the lead runners on the first part of the run before I remembered I had a strategy to stick to and let them get on with it. 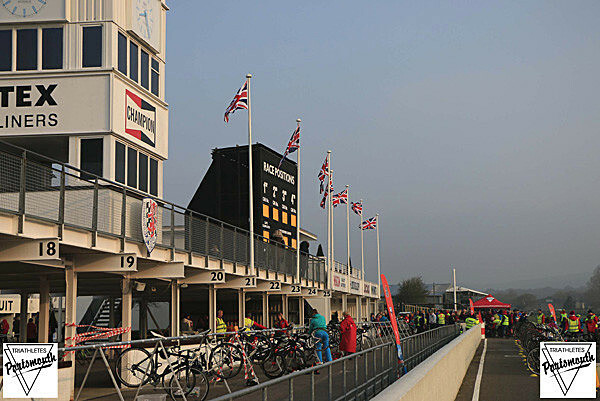 As ever, the stiff wind across the motor circuit was a feature of the bike. I was pleased to be lapping consistently within a handful of seconds throughout the ride. I was less pleased when my rear wheel fell out in transition! The second run was punctuated by cramp and the wind seemed to become particulary unhelpful. This event is a good start to the year; well organised and supported. It was good to meet some fellow Tuffs, and I look forward to racing in Tuff kit throughout the year – when it arrives! 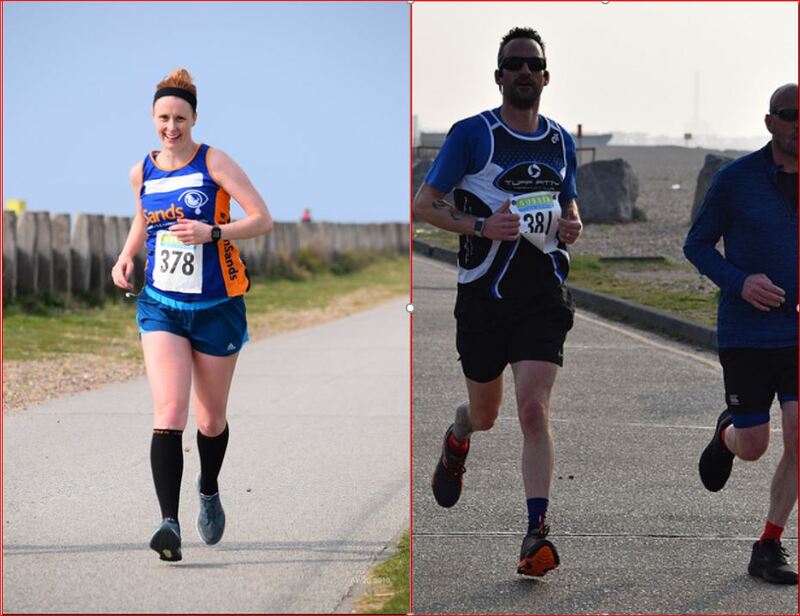 Run by Chris, Danny & Jay at Sussex Trail events this run was stated to be a fast and flat run along Shoreham, Lancing and Worthing promenade. It proved to be… but only in one direction because of the strong winds which impeded progress the other way. A trio of Tuffs entered for their last long run before their marathon’s; Jon & Lee at Brighton & Clare at London. 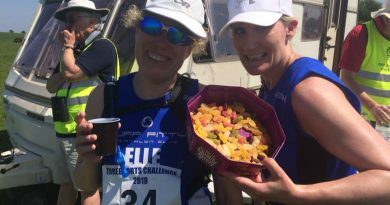 As usual for a Sussex Trail Event race, it went exceedingly well and with a good team of volunteers the comment was made that it was a seamless and chilled out event. Great running from Jon Babbage, then Lee Bishop, who is our newest member, and Clare Worgan. Another long run for marathon training saw a trio of Tuffs enter the Cranleigh15/21. With a route around country roads there is a big loop of 15 miles and then a smaller 6 mile loop. All racers start together – as above, but it is up to everyone when they finish. 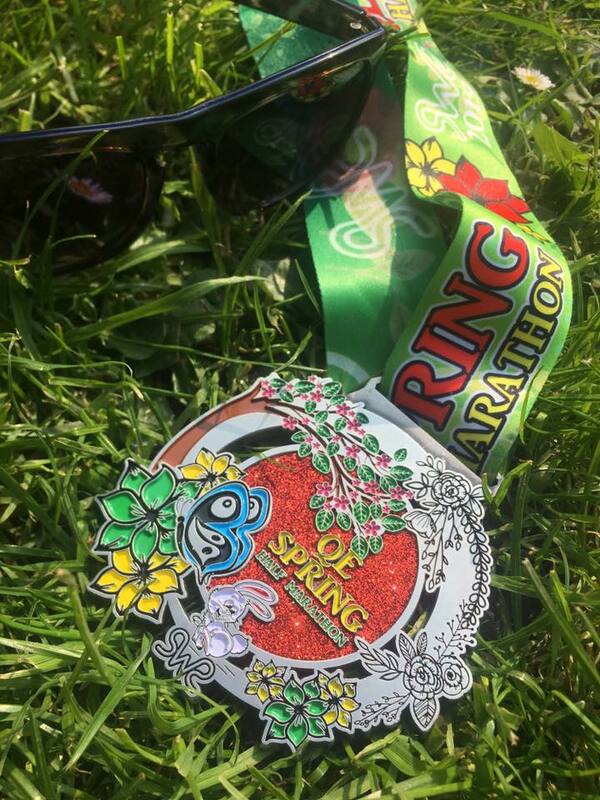 The first route gets runners up to 15 miles and then there is a choice of turning to finish or taking the smaller 6 mile loop for a second lap to amass the 21 miles. Trevor Harvey’s knee was playing up badly so he felt he better not overdo it, and took the 15 mile finish post. Glenn Parisi with two marathons looming in the space of a couple of weeks strode on for the 21, and Murray Hodge also continued for the 21 before the three headed into the bandroom HQ where there were copious amounts of cake to consume. .
Wednesday night in Chichester was the last of the three race series of the Corporate Challenge where runners pushed hard around a 2.8 mile course. Juliette Reader, Chris Sloggett and Debra Cauchy-Duval all did well as it saw them complete all three of the races. At Worthing Park run there was an added twist with the morning designated as a PJ run where people could just roll out of bed and attend! There was some rapid progress along the course with Tom Goddard first Tuff home in 19:18 with Jay McCardle and Danny Cunnett both on the 20 minute mark. James Oram embraced the PJ look as he completed his 98th Park Run with Chris Sloggett also completing his 98th Park Run. Amanda de Ridder and Tim Kenny completed the Tuff Septet. There was just one solitary PJ clad runner at Maidenhead Park Run, but that wasn’t Trevor Harvey who used it as a warm up for his race the next day. Across at Horsham Park Run Ian and Leigh Moore ran around together, although there is no news about whether pyjamas were worn. 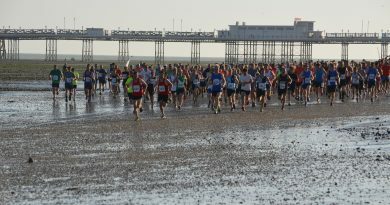 This left Simon Thistlethwaite who ran at Bognor Park Run, and this wasn’t to just make up the numbers. Simon raced round to finish 5th position overall in a time of 19:01. Well done to all 11.